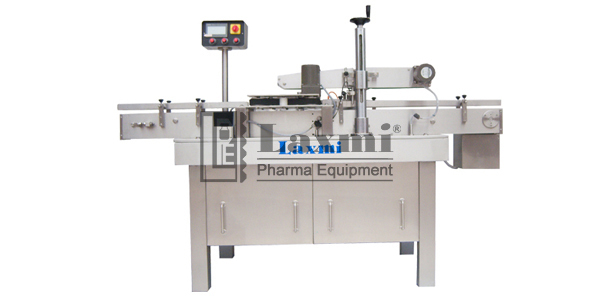 Laxmi Pharma Equipment offers Automatic High Speed Front & Back Sticker Labeling Machine Model: LBL 100FB, It is Automatic, user friendly, Vertical Linear Sticker Labeling machine suitable for applying frond and back labels on Flat / Oval / Square shape containers which are previously filled. Product alignment system synchronized with top holding belt mechanism, with necessary changes in respect to product samples. As the machine is servo motor operated, a customer has an added advantage to run the machine with a minimum required output to maximum of 100 Labels per minute but depending upon the Label Size and Quality.